1. 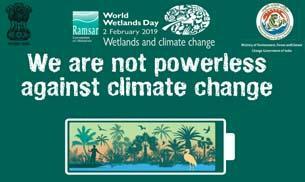 Water is life, and wetlands are the life support systems that ensure functioning of water cycle. India is endowed by a rich diversity of wetlands ranging from high altitude wetlands of Himalayas, floodplains of mighty rivers as Ganges and Brahmaputra, lagoons and mangrove marshes on the coastline and reefs in the marine environments. As per National Wetland Atlas, nearly 4.7% of India’s geographical area is under wetlands.